Back To School Made Easier With Carried Away Chefs- September 7th, 2017 : Divalysscious Moms – Fabulous events for expecting, new moms, and families in NYC! With the start of a new school year we know how busy working parents can be. I want to introduce you a new #FabULyssFind Carried Away Chefs. 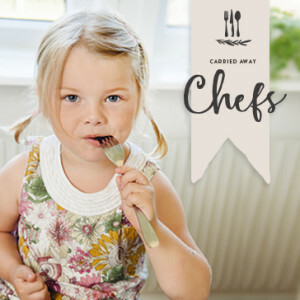 We know it takes a Village in NYC to raise children and I am thrilled that you will now learn about Kate Homes the Founder of Carried Away Chefs and her amazing team that makes the most DeLysscious meals just for you and your family. Q: Your resume is most impressive! You graduated from Le Cordon Bleu and worked with some of the most award-winning chefs. What made you prompted you to open an in home cooking personal chef company? A: Despite being an entrepreneur and having two little kids, I’m all about life balance; so the idea of cultivating a career in food that also afforded somewhat regular hours was always a priority; being able to help busy families create balance for themselves is the ultimate reward for a hospitality professional- I’m a true believer that mealtime should be about enjoying each other’s company and NOT stressing about planning, prepping and cleaning. Q: What can parents expect from your talented team? How do you work, meaning do you custom create the menu for every home differently? Are the same every week? A: Each family’s weekly menu is customized from our current offerings to their tastes and dietary preferences. We source local ingredients to our test kitchen in upper Manhattan, where we develop our tried and true recipes and send the chefs on their way to your home. The chefs bring the ingredients to your house to create your family’s meals, storing it with suggested reheating instructions to enjoy throughout the week. We cook for you once or twice a week depending on your needs. Q: I know you do the food shopping and bring to the home, how many meals do you prepare for the week? What if a family only wants vegeterian dishes? Or have dietary restrictions? A: Our twice- a- week service provides 2 entrees and 2 sides with a baked good or breakfast each time (so 5-6 meals), while the 1 visit is 3 entrees & 3 sides (3-4 meals). We accommodate all types of dietary preferences and our test and production kitchen is a nut free facility. We cook for people who eat gluten free, paleo, vegan and are often called in to help with a specific diet recommended by a nutritionist. Our chefs are adept at navigating kosher kitchens as well! Q: What are your most popular dishes? A: My team laughs at how obsessed I am with our lettuce cups- my original recipe was Chicken& Shiitake Asian lettuce cups but we’ve expanded them to lettuce cup tacos too! We specialize in creating healthy and delicious meals that adults can enjoy but appeal to kids too. Other must-haves are Truffle Beef Sliders and Coconut Pumpkin Soup with Cardemom when the chill hits in the fall! Q: Please share with our readers the cost of the program…. Q: What kind of kitchen do families need? Do they need to have all the appliances or does your team come already equipped with that they need to prepare the meals? A: We bring our own tools but use the equipment at your house. We check in ahead of the first visit on what we might need but generally are always fine to work with what we’ve got- we are very resourceful and have cooked in all sorts of NYC kitchens! With the help of our test and production kitchen we can do some of the heavy lifting ahead of time if necessary. Q: Please share with us some of your most popular dishes… do you also provide dessert? Q: What if the parents are at work, can they leave a key for one of your chefs to go upstairs and prepare the meals? Do you like have someone in the apartment better? What does your staff feel most comfortable with? A: Quite often we find ourselves cooking solo in the home and are comfortable with it. We would ask ahead of time the best way to be let in and where to take out the trash on the way out; other than that we are good to go! Q: How long in advance do you suggest signing up for the program before a family wants to get started? A: We can generally get new families on the schedule in 1-2 weeks. The schedule fills up fast in early fall and early spring though so its always good to plan ahead! Q: Please tell our readers the best way to get in touch with you via email and phone.. Please include the best email and phone number. olive oil, and then grill until tender and lightly charred (alternately broil on HI 5 minutes per side). of salt and pepper. Transfer to a large bowl.